No one is as excited and surprised as I, to be nominated for this awesome award! Thank you Steve of Gardening in Greenwood, for nominating me! There are few awards in the blogosphere, and I come across them here and there, always wondering how it would feel to receive one. O.K., it feels pretty cool!!. 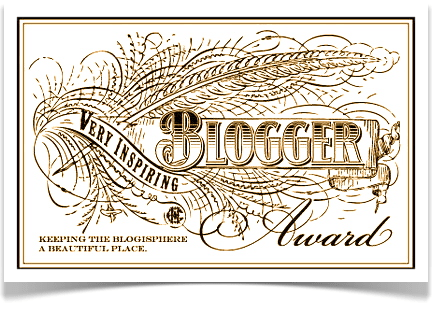 The Very Inspiring Blogger Award, is the first award I came across online. I don’t remember where I saw it winking at me from a sidebar, but I remember thinking to myself, how cool is this, a community of creative people, writing, blogging, sharing and creating community standards, and awards to promote those standards., hmmmmm, wouldn’t it be nice….. And now, well it is hard to believe folks! I feel honoured, flattered and a little tongue-tied.. They say Jupiter and Venus are kissing in the zodiac right now, and there are pleasant surprises for us all. So there you go. Thanks Thor and Freya, and Steven. Steven at http://gardeningingreenwood.wordpress.com is a passionate, gardener with an inspiring, ever evolving garden. With stone pathways and sitting areas to enjoy the views, he has created his own paradise in the middle of the city. Not only does he know his plants surprisingly well, his garden designs are beautiful and well thought out. It’s not a large garden, but like Dr. Who’s TARDIS, it is much bigger on the inside. Steven is not only a connoisseur of plants, an activist and local voice for preservation and conservation of nature, but he is also an ex wildcrafter who has spent time earning his badges first hand from Mother Nature, foraging and collecting medicinal and edible plants in the wild. So when I write about the give and take of a respectful relationship with nature, he knows exactly what I mean. People like this are few and far between. Each and every plant he cultivates in his garden is a specimen. The “walls” of his blog are hung with beautiful photos of his “Babies”, as should be the case with every proud parent. I highly recommend you pop over to http://gardeningingreenwood.wordpress.com, and see what Steven is up to. Though I have spent decades working with plants, I am regularly surprised by plants I have never heard of and always learn something new when I visit his blog. Along with the honour of receiving the Very Inspiring Blogger Award, there are a few obligations. Most have to do with perpetuating the award, and passing it forward. Below, are the guidelines, or rules for any of you whom I have nominated, if you choose to accept the award. There is no obligation to accept it, however, I hope enough of you will carry the torch forward to the continued benefit of the blogosphere, by supporting and encouraging bloggers who inspire you and contribute to standards you would like to see. One of the requirements is, one must nominate 15 other bloggers that one finds inspiring. I have chosen 12. 3 List the award rules so your nominees will know what to do. 7. Proudly display the award logo (or buttons) to your blog, whether on your side bar, ABOUT page, or a special page for awards. Let other bloggers see right up front that you are an award winner and HAVE participated in the award process (there should be an award for that all by itself!). Here is a link for nominees that may provide some extra information on the award and how to proceed. Some of the technical bits. http://thebelmontrooster.wordpress.com/2013/11/25/my-very-inspiring-blogger-award/. O.K., So,,, 7 things about me? 1-I suppose, who or what I am now, and how my life looks, is the sum of my past work, passions, choices and incarnations in this life as a sculptor and craftsman, gardener, father, wildcrafter, shaman, apothecary, perfumer and impaler. Not necessarily in that order. But one thread runs through them all. They all contribute to who I am now. I promise, I will write that “about” page! Really..With some history and background and everything else one might hope for. 2- I live in a luscious, rich, inspiring environment, surrounded by all the natural materials I love to work with. Plants, herbs, wood, stone, bone, antler and horn, resins, oils, tinctures and absolutes. Couched in lovely fragrances, textures and warm colours, magic, medicine, mysteries, spiritual tools, reference books and ancient texts. Throw in some antique carpets, old copper, leather, brass, glass and wooden book cases, apothecary jars and distillation trains, mortars and pestles, beakers and flasks, and add to it a sky-lit loft with Sheepskins and soft velvet to sleep on, and 2 cats. (Who fight with me over ownership of the sheepskin), and you have a general feeling for my working/living environment. As I age, (mature like a fine wine, they say), they all blend together into a general esthetic, and give me something beautiful to come home to, live in, be inspired by, and a reason to get up in the morning. It also gives me safe ground from which to deal with depression, whether providing inspiration and motivation, or a comforting, safe place where I can hide away till it passes. Such is life. I mention this because there must be millions, (and millions), of people who suffer from various shades of depression, silently, It is rampant in our society, and we hesitate to talk about it. 2- I am surrounded by bright, warm, generous, genuine and beautiful people who value me and my work, and care about me. I am blessed that way, and very grateful. 3-I would rather create something original of exceptional quality, and show others how to do the same, than keep it a secret so I can make more money from it. 4- I think if we all support, high quality local goods and their producers, artists, farmers, craftspeople, small businesses, people who really care about quality, the mega corporations will shrivel up and pass away, leaving us with a higher quality of life, and a quieter, cleaner and happier world. The same goes for our governments. We sustain them with our everyday choices. No one else is responsible. 5-I believe in proactive giving. If everyone shared what they had, gave when they saw an opportunity, there would be no lack in the world. No poverty or hunger. I try to follow the old Talmudic precept, “when someone puts out their hand, always put something in it”. 6-I am truly,deeply, passionately in love with mother nature and the feminine spirit that animates her. 7-In September, after a decade and a half of being a single father, raising my son Nathan on my own, I found myself experiencing the “empty nest” syndrome. He now lives and studies in another city. I don’t know where I will go from here in life, but anything is possible, which is an exiting, (and scary) thought. Here is my list of nominees for the Very Inspiring Blogger Award. These are blogs that have inspired me, moved me, made me laugh or made me think, People who I think deserve this award, (and that don’t already have a plethora of awards, including the VIBA), They may decide to decline, or accept. I will leave that to them, but I hope you take time to visit their blogs either way. Well, That’s all for now folks. Time to hit “Publish” and contact the nominees. You are most welcome Candice. It is well deserved. Hi Dan. Thank you so much for the nomination; it’s always deeply flattering to have something you do be recognised. I’m always a little jealous to see people do what you do with plants. I have a keen interest in South Africa’s indigenous plants, many of which have medicinal qualities that are only just starting to be explored, but sadly my interest will have to remain academic; many of the most effective plants are also, at slightly elevated doses, deadly poisonous. It takes years of training before traditional herbalists out here can start unleashing their preparations on the public. You are quite welcome. South Africa seems such a rich and bountiful country, across the board. When I come across a plant that does not appear to be from this planet, my first thought is,” it must be from South Africa”. :-). I’m always little jealous of people that live in proximity to such diverse and unusual flora and fauna. In a self serving kind of way, I am grateful you are sharing your academic perspective and passion, and not pursuing traditional herbalism. I look forward to reading many more posts. Thank you so much, Dan, for nominating me! I’m getting the hang of what to do and how, and will write my Acceptance post in the next few days; life is pretty full on at present, plus wp has its glitch back again, so that slows things down. I am very touched, and also by your emphasis on community, and how we pass this treasure among each other. What an incredibly beautiful and heartfelt post Dan. Your words are so full of meaning and joy in life they really touch my soul. Thank you for your kind words about me and my blog. I feel the same about yours. Respect for Nature is the Key to a good life i believe, and obviously you do too. Respect all around for all Her creations. Lovely. Thank you so much Steve!! Yes I think we share many of the same experiences and philosophies. Meeting kindred spirits is a rare and much appreciated gift.